Welcome aboard the USS John C. Calhoun Veterans Association’s (JCCVA) home port on the web. 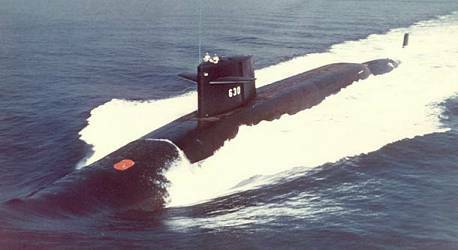 The ship, USS John C. Calhoun (SSBN 630), was a Fleet Ballistic Missile nuclear submarine; whose sole purpose was to be part of this nations “triad” of nuclear deterrence. The “triad” consisted of the long range, strategic bombers, the in ground missile silos, and the FBM submarines. This “triad” of deterrence, whose destructive potential was immense, was the force that literally brought the Cold War to an end and was a major factor in the eventual collapse of the Soviet Union. We, the members of the JCCVA have united with our shipmates to keep the memory of this fine ship alive and to rekindle the friendships we share, and still cherish. We hope you enjoy our site and leave us feeling as if we have done a good job honoring this fine submarine and her service of over 30 years to our nation. Some of our pages have sound so you may want to turn up your speakers. Please look around and enjoy your time aboard! We’re glad you’re here!.